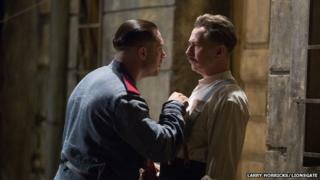 Russia has blocked the release of the new film Child 44 because authorities say it "distorts" historical facts. The culture ministry says that the movie, which was due to be released on Friday, was withdrawn after a preview screening raised concerns. Issues included a "peculiar interpretation of events before, during and after the Great Patriotic War as well as images and characters of Soviet citizens living in that historical period", the ministry statement says, using the Russian term for the conflict with Nazi Germany. It adds that showing "this type of film" in the lead-up to the 70th anniversary of victory in World War Two is "unacceptable". The film stars British actor Tom Hardy as a disgraced Soviet secret police agent who's trying to track down a serial child killer in Stalin-era Russia. Hardy's character is pitted against a "system-wide cover-up" and those who deny crimes can exist in a utopian state, according to the film's own website. But the film's characterisation of Soviet officers has displeased Russian officials. Culture Minister Vladimir Medinsky has complained that it depicts them as "physically and morally base sub-humans" and makes the country seem like Mordor - the fictional and terrifying land in Lord of the Rings, according to the state news agency RIA Novosti. One Russian film producer says the decision not to release Child 44 is bad for the country's film industry. "Before, films where Soviet and Russian heroes were presented not in the best way have been released in Russia, but nothing similar happened," Alexander Rodnyansky tells the RBK business news website. "Now everything to do with history should clearly fit into a kind of framework set by the culture ministry."